As an ecumenical choir consisting of members of any denomination or none, the Pilgrim Singers have now been going for ten years under the leadership of their founder, Jane Fenton. It is open to anyone regardless of experience who wishes to join and sing in a friendly group that puts on several concerts each year, the most important of which are the Summer and Christmas concerts. Last year’s Summer Concert was held in the gardens of the Wincanton Manor House “The Dogs” and was in aid of the Mityana Charity in Uganda. This is a small charity which provides water wells and infrastructure for extremely poor rural communities. The choir heard about it through one of its members who was an old friend of its founder, Hugh Wakeling. Hugh is a retired engineer and priest and has been visiting Uganda regularly to supervise the charity's projects. They have just sent him the attached photo showing that the Pilgrim Singers contribution last year was enough to cover the cost of building a toilet block alongside the local school building that the charity had provided without a toilet. 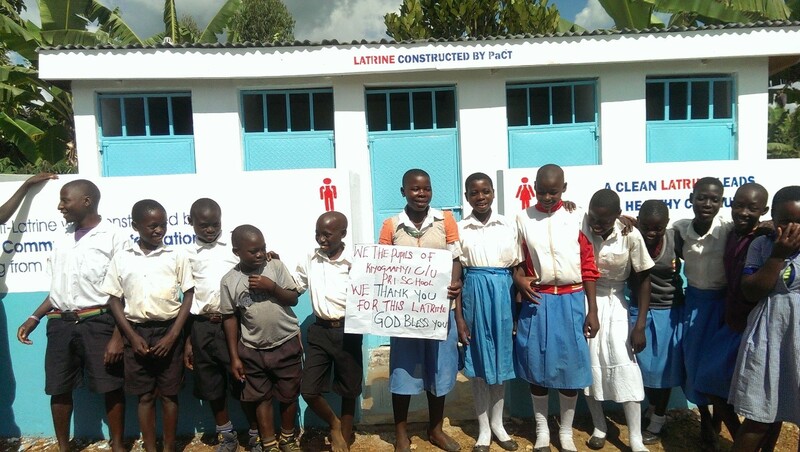 This new building is now much appreciated for the hygiene it provides and teaches. This brings to £20,000 the total raised for charities by the Pilgrim Singers during its first decade.